Osaka Castle, and Osaka-jo – castle in Osaka, which played an important role in the history of Japan, the end of XVI – early XVII centuries. Osaka Castle was built at the beginning of the XVI century on the orders of Toyotomi Hideyoshi – the great general, to unite the country under his command. The castle was to be the political center of the new regime, Hideyoshi, and also serve as a defensive structure. However, in 1615 the shogun Tokugawa Ieyasu captured Osaka Castle, and the commander of Toyotomi rule came to an end. The fortress has suffered greatly as a result of numerous sieges, but later restored in 1620. Later, in one of the towers was struck by lightning and burned to the ground the castle.Undertaken many attempts to reconstruct the complex, however, in the form in which it can be seen now that it exists only since 1930. Some of the castle buildings were damaged during the Second World War, but later restored in the 1990s. 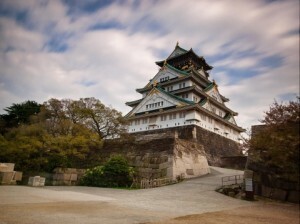 The main attraction of the complex – the main tower, which is now a museum that tells the history of Osaka Castle. The interior of the tower is absolutely modern, to the upper floors, visitors can get there via the elevator. Around the main tower of the castle are located detached buildings – the citadel gates, towers, defensive walls. The castle complex is surrounded by a moat, the castle park total area of ​​2 sq / km. The Osaka Castle Park are many interesting attractions: the cherry orchard Nisinomaru particularly popular during the cherry blossom, here is an old tea house and a guest house. In walking distance from the complex is the City Museum, Osaka, where visitors can learn more about the history of the city and the stadium Osaka-jo. 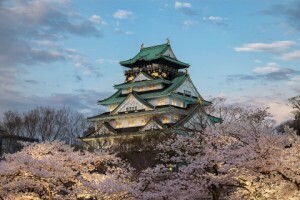 In summer, the Okawa River, on the north side of Osaka Castle, there is a festival of Tenjin – one of the three most famous and large-scale Japanese festivals, takes place in honor of the famous scientist, politician and poet Sugawara Michizane. He is revered as the patron of literature and education. About a hundred boats down the Okawa River, the evening begins launching fireworks. Long working days during vacation and holidays. is open until 20:00 during the cherry blossom. On Mondays (or the following day if Monday a national holiday), New Year’s holidays. 200 yen (500 yen during flowering cherry). The nearest metro station – Tanimachi 4-chrome line Tanimachi and Chuo. Nearest station JR – Osakajokoen line JR Loop Line: 10 minutes, 160 yen from JR Osaka Station. It is recommended to enter the territory of the complex through the southwest entrance gates Otemon.